A beginner aquarist? 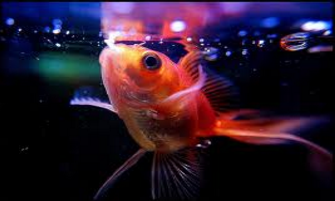 Are you searching for reliable information to diagnose the problem with your goldfish? Is your goldfish lying in a corner of the tank, not eating, or showing signs of illness? If your answer is ‘yes’ you’re in the right place. Read on because you’ll find out how to look after goldfish with tips and techniques that have proven their worth. In well-aerated water as little as 1% by volume of water may contact oxygen. Goldfish obtain oxygen by extracting it from their habitat. The most popular way of providing aeration is by an airstone attached to an airline. It generates a stream of bubbles which draws water to the surface as they rise. When it comes to the size of bubbles produced by the airstone you don’t want too fine a mist, or big bubbles racing to the surface. Just a steady stream of tiny to medium-sized bubbles that take their time going upwards giving them time to add oxygen to the water. The aquarium needs to be set up in a way that it’s never deficient of oxygen. Carbon dioxide is a by-product of respiration and an excessive amount of gas in the tank is dangerous to goldfish. When water is circulated, harmful carbon dioxide is carried to the surface and released into the atmosphere. Is your goldfish gasping for air, swimming in unusual patterns, refusing to eat, displaying skin issues or usual eye appearance? These are signs of distress. Diagnose these quickly and the good news is these problems can be treated. Recognising the symptoms of stress and disease in your fish means treating them quickly to improve the condition and outcome. Flukes, white spot, tail or fin rot, dropsy, constipation some of the most common. Water conditioner is essential and there's lots of choice. But if you're wanting the best choose one that provides additional benefits to the goldfish like coating scales and fins to protect them and relaxes fish. Female bettas live quite well together. Males not so much and need individual tanks or with other on-agressive fish. Common ailments affecting Bettas are fin rot and ich. The forked tail is at least 3/4 of their body length and a distinguishing feature of fast, agile comet goldfish. Comets are hardy and fertile making these good fish to breed. If you've been wondering why so many goldfish are orange, where they come from or how long you can expect your fish to live, this page is for you. The best pond pump is determined by the size of the pond. Submersible pumps are economical and practical for smaller ponds (to 1000 gallons). External pumps are energy efficient and tough. Your 'need to know' before starting to build a koi pond. Maintenance tips and recommended pond water treatment products. On this website you’ll find tips to help resolve your fish behavior problems and health issues quickly and for good. You might have lots of questions like finding the best filter for your tank, how to tell if your goldfish is pregnant or what’s the best food for your fish. The easiest way to find out everything about your pet is to visit our us regularly. We’re sure you’ll always find useful information.